And you thought elearning was boring. Jeff Havens, author of Unleash Your Inner Tyrant!, provides advice like “Lay The Smack Down,” “Rise Above the Peons,” “Proofreading is for Idiots,” and “Wrt ur emails lk ur txtng!”. His elearning courses suggest you should grow a mohawk, come to work hungover, have your laptop out during meetings, and hit “Reply-All” for every e-mail. By teaching learners what you shouldn’t do, he hopes to get across what you should do. He capitalizes on the things your coworkers do that drive you insane–leaving their food in the breakroom, flirting in the office, asking stupid questions–to teach you how to not be them. It’s humorous in its absurdity and novel in its approach. 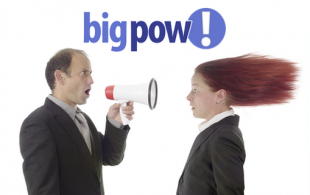 Big Pow online training courses are still filled with all the elearning standards: quizzes, slides, photos, videos, and reflections are all there. The sarcastic twist keeps things interesting, as you are always seeking to select the traditionally wrong answer, wondering why stock photos like those shown exist, and entertained by Jeff Havens’ comedic prowess. Dining Etiquette: You Weren’t Really Raised in a Barn, Were You? OpenSesame has recently partnered with Big Pow to provide several of their courses through our easy-to-use marketplace. Check out their full bundle of all 8 Big Pow courses on professional excellence. Humble people hate talking about their own accomplishments. Without asking them in advance, claim their work as your own. They will appreciate you communicated their work to upper management, and you’ll get all the credit. Workers are expensive and unmotivated. The longer they are with you, the more disenchanted they become and the more you have to pay them. Interns, on the other hand, are free and lack the specialized technical training that constricts your salaried employees. Take advantage of feisty young college students for the cost of a single LinkedIn recommendation. Delegate all decisions and responsibility to upper management. Micromanagement exists for a reason! Don’t take the time to learn something new, take on a new project, or make minor decisions. Not only could you mess something up, but you’ll waste your time. What are some other great “Big Pow”-style advice you can think of? Don’t comment below.